Our friend Helen Richmond in Tuscany tipped us the wink on this unusual combo. 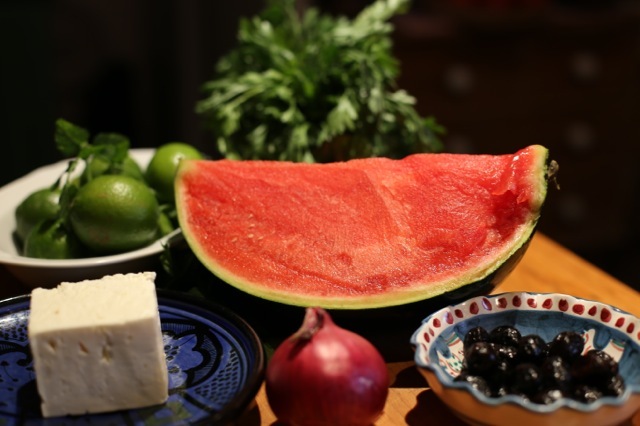 The tang of the lime juice offsets the sweetness of the melon. The mild bite of the onion complements the saltiness of the feta. I shut my eyes as I take a mouthful and I’m on Corfu–and they are grilling the lamb chops for the main course! 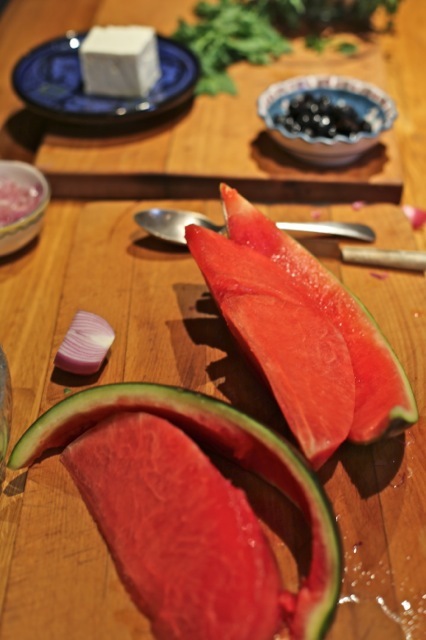 Release the flesh of the melon by carefully running a sharp knife round the inside of the crescent of rind–take your time! Lightly steer a teaspoon along the ridge of pips skillfully dislodging them without mushing up the flesh. Cut the flesh into bite-size squares. 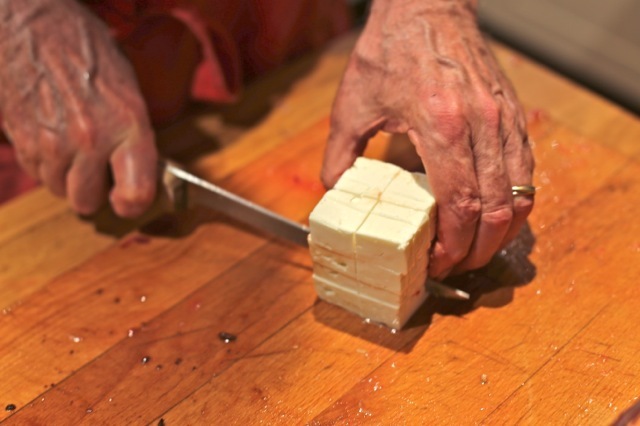 Cut the feta in smaller squares. 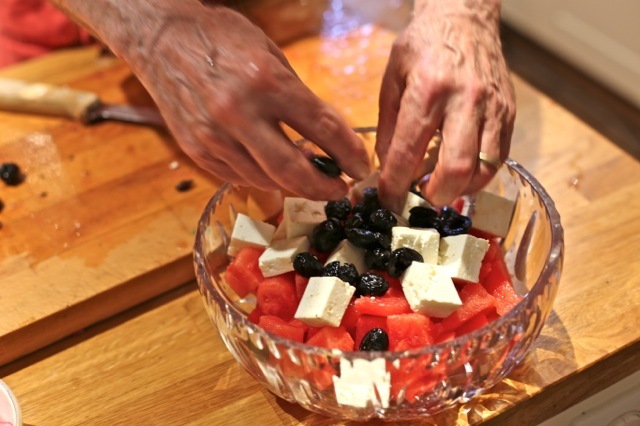 Place the melon and the olives in a bowl and add the feta. Sprinkle over the red onion and the mint. 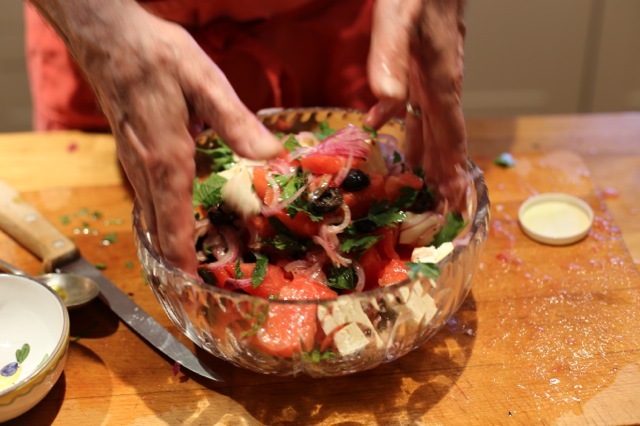 Pour this over the the salad and carefully turn it all over–hands (washed!) work well! 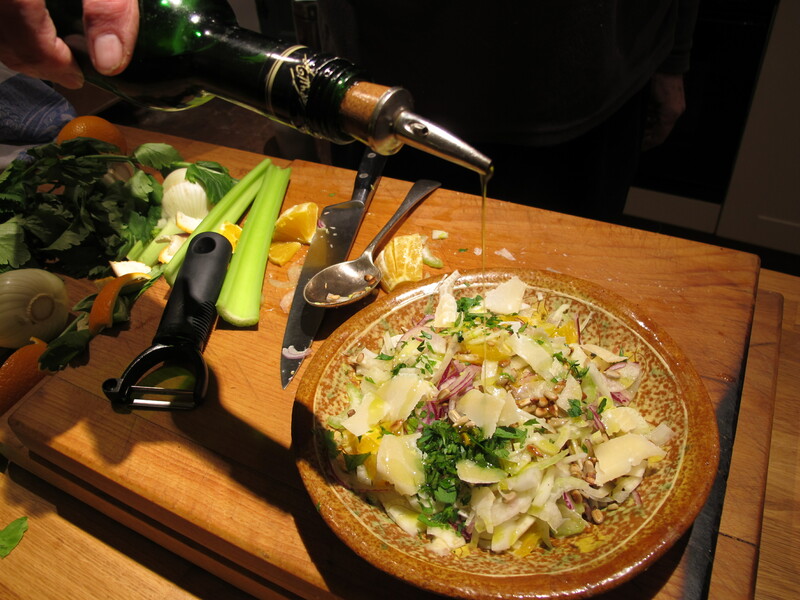 Add the parsley leaves and refrigerate until you are ready to serve (best served thoroughly chilled). Quinoa is grown in the Andes and has shot to fame–though how to pronounce it is still a question. We’ve settled for keen-wa (sometimes I revert to keen-o-wa!). It comes in a number of colours though so far I’ve only seen red and white and has a reputation for being easily digested. It is gluten free. A salad for all seasons this. 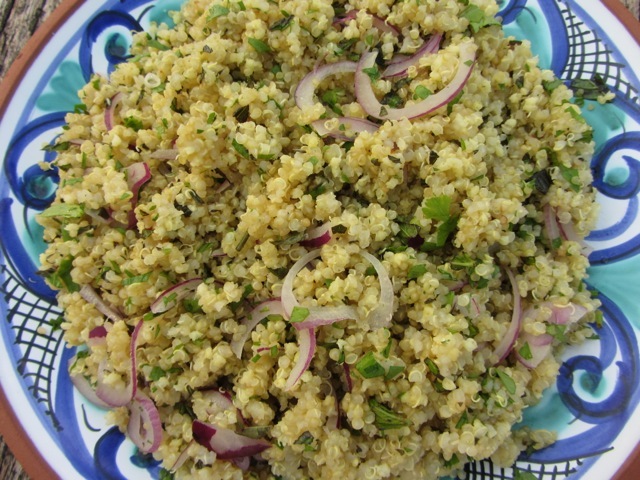 Light and fluffy white quinoa is laced with thinly sliced red onion and flavored with lemon juice, olive oil, mint and parsley. It looks good on a favourite plate and has surprising depth of taste. 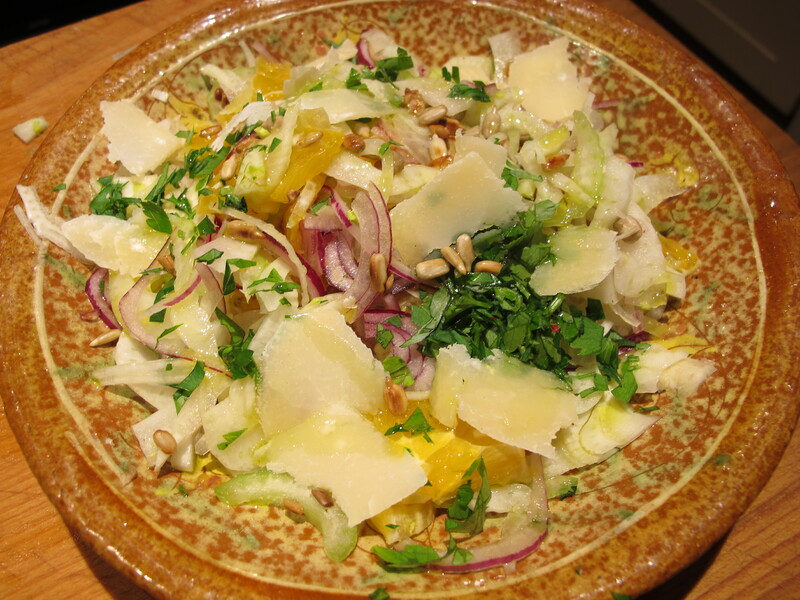 It’ll feature in my new book, Healthy Eating for Life (to be published in January 2014). Place a saucepan over a low heat and pour in the quinoa. Let it dry roast for 5 minutes–stirring all the time. Cover and cook for about 20 minutes–until the quinoa has absorbed the liquid and has puffed up. Add the oil and lemon juice to the cooled quinoa and stir in with a fork. Fold in the mint and parsley, again stirring them with the fork. 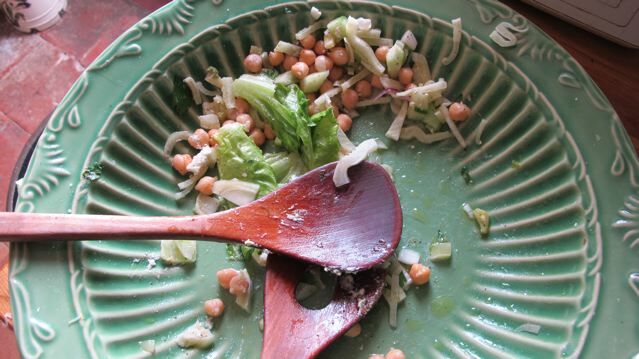 Transfer the salad to a pretty plate. Sprinkle with some more mint and parsley. My first posting on this blog was a year ago today–7th of February 2011! Poaching Eggs–was a homage to one of my food heroines, the formidable Elizabeth David. I can’t remember exactly the weather that day but it may not have been so different to today’s–which is nose-endangeringly cold. So a long nod of thanks to everyone that has visited and those that continue to visit and thanks too for the comments–they are all read and much appreciated. AND special thanks to my in-house photographer and editor with whom discussion is always lively and from whom I learn a lot! Here’s a salad to celebrate. Seasonally crunchy (not much choice from the locals this morning)–with a juicy orange and some sunflower seeds, to put one in mind of seasons to come. It got the nod at lunch today from Meredith–(though not the mackerel fillet that it accompanied–next time I’ll use less smoked sweet paprika!). Mix the first seven ingredients together with care in a favorite bowl. Sprinkle with salt and the oil–add more oil if you like. 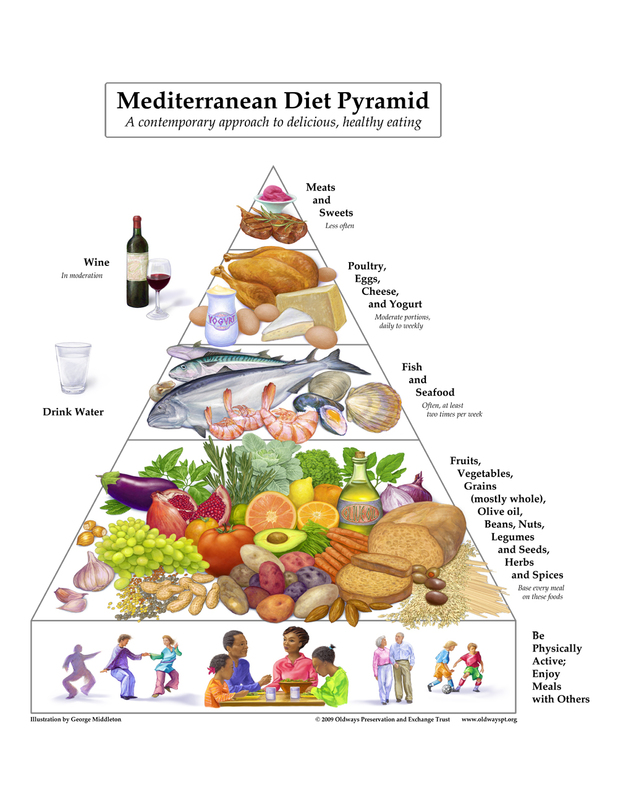 The Pyramid is History–Step up to “My Plate”. The “Food Pyramid” was an early post back in February. 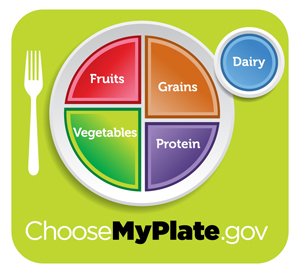 In a campaign backed by the First Lady Michelle Obama, this has now been replaced (by the USDA — the American Department of Agriculture) by “My Plate”. The new icon sets out on “your plate” –a guide to a healthy, balanced way of eating. In principle anyway, it is simpler and more logical than the pyramid image–we eat off plates not pyramids–though I don’t find it visually pleasing. and without intending to–it was stuff I found in the refrigerator– I ended up pretty much following the guidelines. with an olive oil and lemon juice dressing–oh and a few dry roasted (in a frying pan) pumpkin seeds(pv) scattered over, seasoned with salt and pepper. 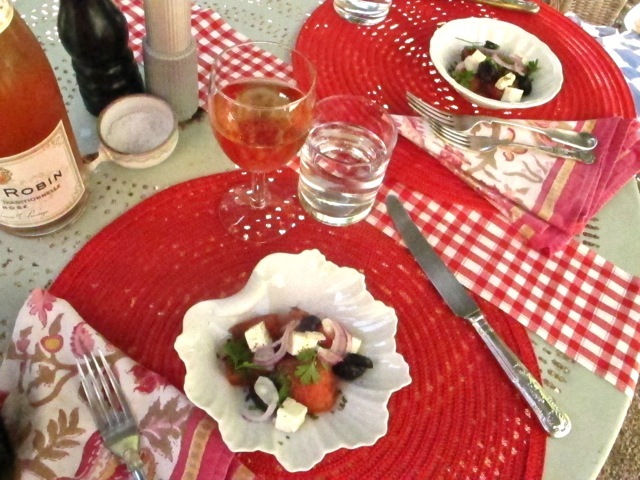 And–we ate it off plates!